With an area of more than 800,000 square kilometers and home to more than 60 million people, the Mekong River Basin is one of the largest and most biologically diverse ecosystems on Earth. While the seasonal migrations of the fishes of the Mekong River Basin may have come as a surprise to Western scientists, had anyone thought to ask the women and men of the thousands of fishing communities in the countries of Cambodia, Lao PDR, Thailand and Vietnam, the Mekong fish migrations would have been recognized decades before the 1980s. In fact, it was not until the early-1990s that research of the fisheries-related local ecological knowledge of communities in the Mekong River Basin began. It was this research that formed the basis for an emerging movement of fishers, scientists, researchers and activists that documents and supports the efforts of local fishing communities in the Mekong River Basin to manage their fisheries, and their locally-developed systems for managing, using and conserving their forests, fields and common lands, their rivers, wetlands and lakes. A casual reading of events in the Mekong River Basin over the past five to ten years would indicate that cooperation and "sustainable development" is making progress in the countries of Cambodia, Lao PDR, Thailand and Vietnam. The international agreement between the four countries is called the Agreement on the Cooperation for the Sustainable Development of the Mekong River Basin. The "mission" of the Mekong River Commission (MRC), the regional planning institution, is "[T]o promote and coordinate sustainable management and development of water and related resources" in the Mekong River Basin. The Asian Development Bank-initiated regional infrastructure planning and implementation program is called the "Greater Mekong Subregion Economic Cooperation" program. However, all of this "cooperation for sustainable development" is cooperation between governments, international financial institutions like the Asian Development Bank (ADB), bilateral 'development assistance' agencies such as the Japan Bank for International Cooperation, and transnational corporations. As such, this cooperation includes bankers, economists, engineers, politicians, bureaucrats, 'expert consultants', and the employees of inter-governmental institutions like the MRC. Thus, "sustainable development" in the Mekong Region is large-scale hydroelectric dams, logging of the region's ancient forests, road-building and an emphasis on increasing transportation of commodities, massive irrigation and electricity-transmission systems, chemical intensive mono-crop agriculture, aquaculture of exotic (non-native to the Mekong River) fish species, etc. 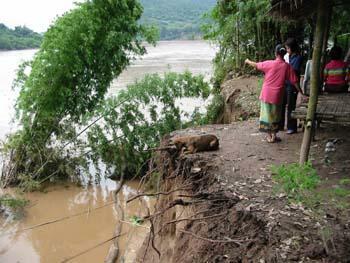 Clearly, the "sustainable development" being implemented in the Mekong Region is nothing new. Rather, a few examples of "sustainable development" in the Mekong Region indicate that this is nothing but the old, discredited model of development that has victimized hundreds of millions of people in the Majority World, the South, the 'Third World', for decades. The Navigation Channel Improvement Project on the Upper Mekong River, known locally in Thailand and Laos as the 'Mekong rapids blasting project', would dynamite and excavate a navigation channel through 21 rapids and shoals in the Mekong River along the Burma-Laos border and the Thai-Laos border. According to the Environmental Impact Assessment (EIA), a joint Environmental Impact Assessment Team and a Detailed Survey Team "went to the working sites [10 rapids and one shoal] along the Upper River on April 18 and April 29, 2001 respectively for the purpose of a detailed survey and hydrological data collection." In other words, the project EIA was based on two days of field investigations. On the basis of this two-day-long "environmental assessment" of probably the least-studied and least-known ecosystems of the Mekong River, the EIA concluded that there would be no long-term impacts on the fisheries and fishing-based livelihoods of communities living along the Mekong River in Laos and Thailand. The fact is, the EIA does not assess these potential impacts. As a result of a request from the Government of Laos, the MRC contracted academics in Australia and New Zealand to review the EIA. All of the academics condemned the EIA as fraudulent. The academics sent their reports to the MRC. The MRC sent the reports to the governments of Laos and Thailand. Both governments rejected the opinions of the academics and committed themselves to the project. For whatever reason they support the Mekong rapids blasting project, these governments are willingly endangering the lives of thousands of families living along the stretch of the Mekong River that will be damaged by the project. These rapids are important habitat for fish, other aquatic animals and plants that contribute to the food security of these families. None of this was considered by the EIA for the project. Unfortunately, the EIA for the Mekong rapids blasting project continues a long-established tradition of using EIAs to justify the construction of large-scale infrastructure projects, rather than as an exercise in determining the potential environmental and social impacts of a proposed project. The EIA for the infamous World Bank-funded Pak Mun dam on the Mun River in northeast Thailand ignored the importance of the Mun-Mekong fisheries to the economies and food security of fishing communities along the Mun River. 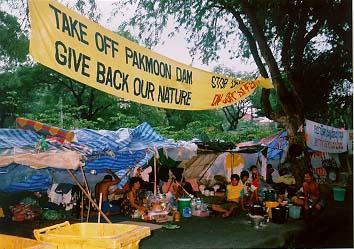 More than 5,000 families have witnessed the destruction of their fisheries and livelihoods by this dam. The EIA for the Yali Falls hydroelectric dam on the Sesan River in Vietnam considered the potential impacts on the river and its fisheries on an eight kilometer-stretch of the Sesan below the dam. Now, more that 50,000 people living along a 200 kilometer-stretch of the Sesan River in northeast Cambodia have witnessed deaths by drowning, abnormal flooding, and severe damage to their fisheries; all as the result of the operation of the Yali Falls dam located upstream in Vietnam. The EIA for the proposed World Bank-funded Nam Theun 2 hydroelectric dam in central Lao PDR completely ignores the potential impacts of this project on the Xe Bang Fai River's fisheries and fishing communities. The dam would divert millions of cubic meters of water from the Theun River into the Xe Bang Fai. This diversion would completely alter the natural flow of the Xe Bang Fai River, potentially destroying the fisheries and riverbank vegetable gardens of more than 100,000 people living along the Xe Bang Fai and its tributaries. This is how poverty is created by "development". Yet the single most important threat to the economies and livelihoods of millions of people living in north and northeast Thailand, Laos and Cambodia are the massive hydroelectric dams being built on the Mekong River in Yunnan province of the People's Republic of China (PRC). Two dams, Manwan and Dachaoshan, have already been built, and local communities in the immediate downstream countries of Laos and Thailand have reported significant alterations in the Mekong River's natural flow during the past five years. But early this year, the Government of the PRC announced the beginning of the construction of the Xiaowan dam. At a height of 300 meters, this monstrous dam will be able to capture some 25 per cent of the Mekong's total annual volume of water flowing from Yunnan province so as to fill the dam's reservoir and begin generating electricity. The potential impacts on the natural flow of the Mekong River all the way down to Cambodia and its Great Lake are potentially catastrophic. The massive fish migrations of the Mekong River Basin could be disrupted, preventing the reproduction and feeding cycles of the fish. The productivity of the fisheries ­ and the food supply of millions of people ­ may decline dramatically. No EIA has been done that considers these potential impacts, which threaten the food security of millions of families living along the Mekong River and its tributaries in Thailand, Laos and Cambodia. The people of the Mekong River Basin are facing huge challenges in their efforts to manage and conserve their natural fisheries, and indeed all of their natural resources, from narrow-minded development like the large hydroelectric dams described above. The governments of countries in the region have refused to listen to the concerns of their people, non-governmental organizations (NGOs), academics, and fisheries experts. International financial institutions like the Asian Development Bank and the World Bank, and agencies like the Japan Bank for International Cooperation and dozens of other foreign 'official development assistance' agencies, apparently prefer to continue investing millions of dollars into these so-called "development" projects rather than think about the potentially fatal impacts of these projects on the people of the Mekong River. The people of the Mekong River are emerging from decades of violence and social disruption. They are beginning to re-establish the social and cultural institutions of their communities. Many communities are working together to try to manage and conserve their lands and forests, their rivers and wetlands, so as to ensure their food security and ways of life. They want rights to their lands, they want to work with their governments and NGOs to manage their natural resources and to develop according to their own needs and aspirations. These communities also need the help of concerned citizens in countries like Japan, Australia and the European Union to monitor and actively influence the actions of their own governments and of the international financial institutions their governments fund ­ the very institutions that are laying the groundwork for the "sustainable development" of the Mekong Region, and for the impoverishment of the millions of people who live with the natural wealth of the forests, lands and rivers of the Mekong River Basin. Dave Hubbel has been researching issues relating to development and the environment in the Mekong Region for the past 12 years. He is presently connected with TERRA. Walter Rainboth, Some basic information about the Mekong fishes, unpublished manuscript (1992). R.M. McDowell, Evaluation of Report on Environmental Impact Assessment of the Navigation Channel Improvement Project of the Lancang-Mekong River from China-Myanmar Boundary Marker 243 to Ban Houei Sai of Laos: The fisheries impacts reviewed, National Institute of Water and Atmospheric Research, New Zealand (January 2002), p.6.